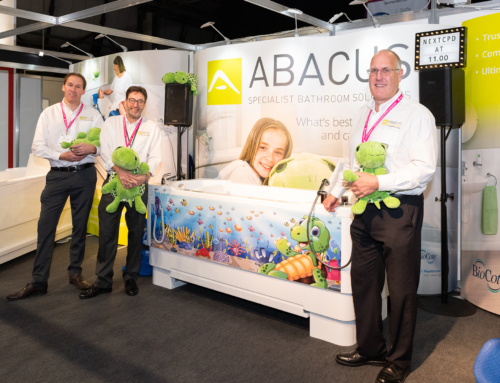 Abacus Healthcare successfully showcased its hi-lo baths for disabled bathers at Kidz to Adultz Wales and received large numbers of entrants for its ‘Guess the name of Abacus’ Big Bear’ competition (7th July 2016, House of Sport, Cardiff, Stand D4). Kidz to Adultz Wales was a new event in the established series of regional Kidz exhibitions organized by Disabled Living. Held in Cardiff this well attended event provided the free opportunity for healthcare professionals, carers and parents to discover the latest products and services that help children living with disability. Abacus Healthcare exhibited its popular Gemini and Aries powered baths that deliver greater care, comfort and safety for disabled bathers and their carers. Through various features including height adjustment and bather transfer seats, Abacus baths eliminate the need for carers to manually lift bathers hence protecting them from back or muscle injury. 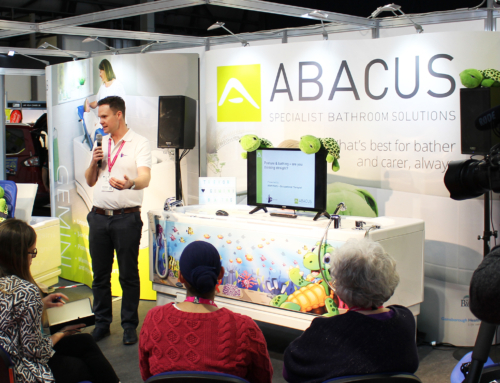 The Abacus Product Specialists on stand D4 were busy throughout the show meeting Occupational Therapists from several local Welsh authorities including Bridgend, Swansea and Carmarthen. The height adjustable Gemini bath with integrated platform generated high levels of interest along with literature regarding the new ‘#BathingIsBetter’ social media campaign currently being run by Abacus. When applying for a Disabled Facilities Grant, this campaign provides essential information to help parents and OTs justify their need for an accessible bath instead of a wet room. Families also spent time trialing the Gemini bath and encouraging their children to enter the Abacus competition for a chance of winning a large cuddly bear. Visiting children were given a list of names to choose from, one of which was the correct name of the bear. The lucky winner will be announced shortly.